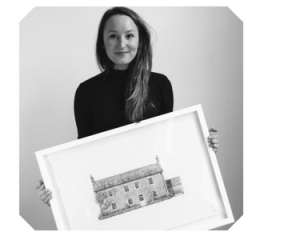 From architecture to art – "But I don't want to work in the City!" When did you first decide to pursue a career as an artist? I had been selling my artwork and doing commissions from the age of fourteen but I never considered working full-time as an artist. I continued to sell my work throughout university and even whilst working in an architectural practice, but I never thought about a career as an artist. It wasn’t until I had quit my job and had absolutely no plan what to do next that I thought I had nothing to lose, so I decided to give it a go. I had by this point been working in London for a couple of years and thought that whatever I did next I wanted to be something that really excited me and I could see myself doing for a long time. What do you wish someone told you beforehand? My dad is a wildlife artist and works from home, and growing up I helped out at exhibitions and we would work together in his studio, so I had a pretty good understanding of what I was getting myself into! I had seen what it was like to organise and run an exhibition but I hadn’t realised quite how exhausting it is – especially solo exhibitions when you are in charge of everything by yourself. I also wish someone had told me how lonely it can be, as I’m a real extrovert and loved working in an office with people always there to chat, so it was a huge transition from having work colleagues to working alone from home. I have now had three years to combat the loneliness and don’t find it a big problem anymore, as a great solution I’ve found is listening to podcasts and audio books. Lastly, I think I was naive to how totally all-consuming the profession is and how hard it is to switch off at the end of the day or the weekend, maybe it is just the pressure of working by yourself and other people who run their own business or are self-employed might feel the same. As architecture is the focus of my artwork it means that everywhere I go I am always looking out for views to draw or buildings to photograph, so all too often holidays can turn into architectural tours! The early stages of developing a career as an artist can be tough financially. What did you do to support yourself during this time that was flexible enough to give you the space and time to develop your art career? I was living and working in London before I started my career as an artist, but when I quit my job and started drawing I knew there was no way I could afford to pay London rent, so I packed up my stuff and moved back to my parents’ house in a small village in rural Scotland. My parents have always encouraged me to be very independent so if I wanted to come back home I could only do so for six months, but if I wanted to stay longer then I would have to start paying rent. So, this gave me six months to get a portfolio of work together and at the end of the six months I planned to have an exhibition in London. I worked seven days a week to get the drawings ready and I found setting a deadline was a great incentive. I thought six months was a good trial period and, if by the end of it I wasn’t selling any work, I was fully prepared that I would have to start looking for full-time employment. Luckily within the first month of drawing I was already selling my drawings and taking on commissions, so I had an income immediately and after my solo exhibition I was able to move back down to London. I personally find having the financial pressure is great motivation to work hard and having a set time-frame in which to start a career means you can throw everything at it, so if it works out that’s great, but if not then you’ve not spent years trying. Aside from the obvious (talent! ), what skills do you think are useful in developing a successful career as a freelance artist? Something I learnt from studying architecture at Cambridge was to be very disciplined and self-motivated with my work. This has been a great skill to have practised as you need to have the drive to force yourself to work hard, even when you don’t have a boss there to spur you on. I find the job requires me to be very self-sufficient as I deal with the marketing, accounts, communication, sales, production, and decision making. To deal with this you need to be very independent as you don’t have anyone else to lean on. What I think is more stressful than the tasks and workload itself is dealing with making decisions and fixing problems by yourself without anyone else to bounce ideas off or share the stress. 8.30am – I like to start the day by leaving the house and working in a cafe as I find it’s nice to start the day by going for a walk, and makes a mental separation between home and work. 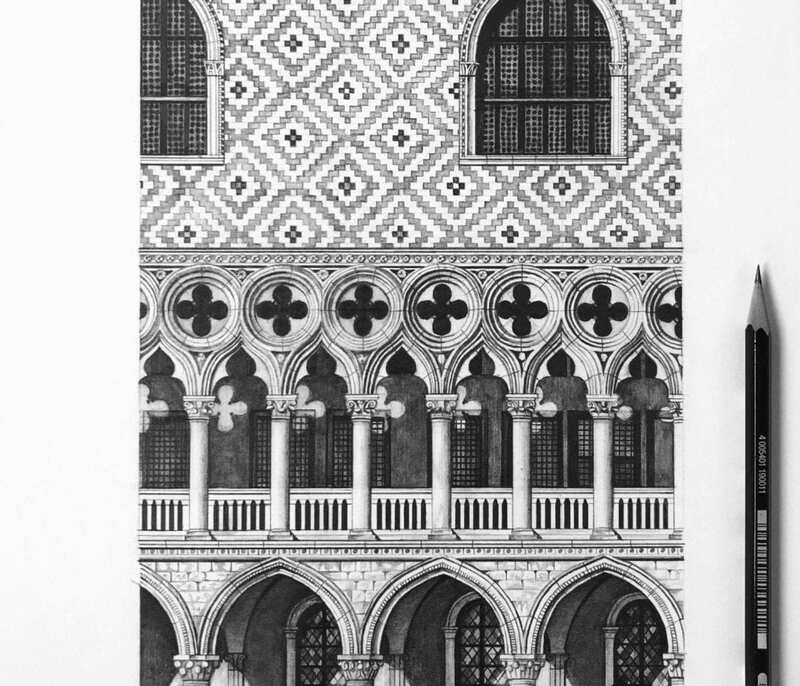 Here I do computer work which can be: replying to commission enquiries, answering emails from kids doing their GCSEs and A-Levels and wanting advice, planning exhibitions, editing my website, and more recently I have been editing a book of my drawings of Venice. 10am – I get back to my studio at home and sign and send out any limited edition prints which have been ordered the night before and take them to the post office. 10.30am – Start drawing in my studio at home with some podcasts on in the background. 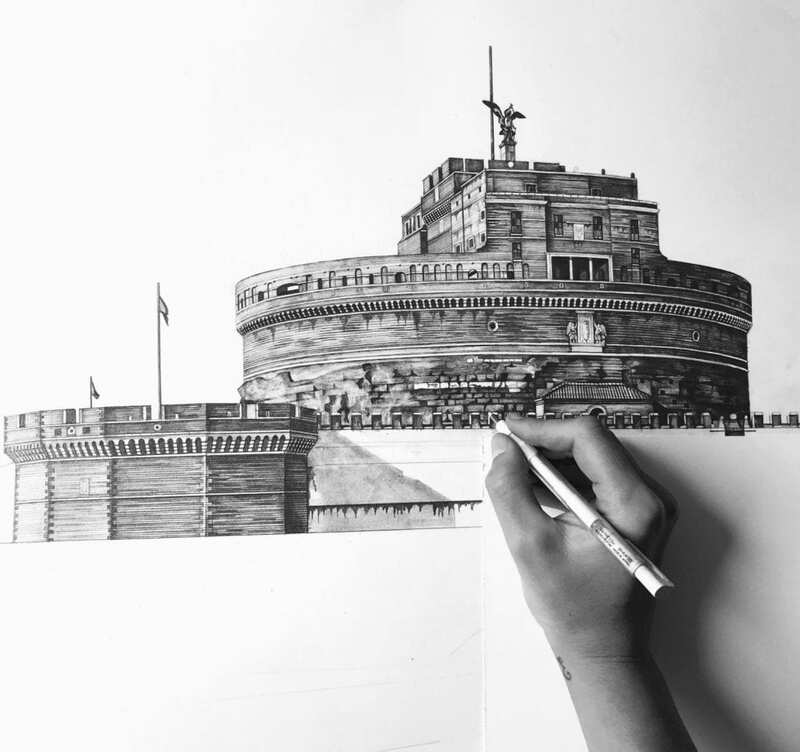 2pm – I continue drawing in the afternoon and make sure to take a photo of my work in progress towards to the end of the day and then I share it on Instagram. Social media has been a really exciting part of my work from the beginning because when I started my career as an artist I shared all my drawing process on Instagram which was a great encouragement to me starting out, and now I have around 55,000 followers. 6pm – I like to end the day by going to a yoga class as I find it’s a great way to relax and unwind from work and also is physically really good for my posture as I spend most of the day hunched over a drawing board. At university I absolutely loved model making and rather than doing my drawings on the computer I did all my plans and elevations by hand. I think this is when I first realised that what I find most rewarding is having the physical manifestation of my hard work in front of me at the end of the day. For more on Arts & Heritage careers, see the Careers Service website. You can explore more of Minty’s work at www.mintysainsbury.com.